6 June - 19 September. 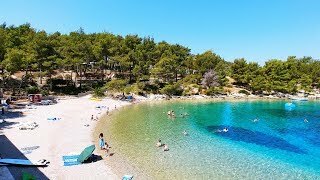 Situated at the western end of Hvar, Croatia’s longest and reputedly sunniest island, Camp Vira is a quiet site built around a small protected bay with crystal clear water and a 200 m. long, curved, pebble beach - an ideal place for sunbathing and swimming. Bordering the beach are an open plan bar and a restaurant. Most of the 172 pitches, all with 16A electricity, surround the bay and are set on steep terracing under ample pine tree shade. With extensive use of natural stone walling and good plant and tree cover, the site fits in very well on an island renowned for its unspoilt beauty. Hvar has been inhabited since prehistoric times and because of its mild Mediterranean climate and geographic position, many different cultures have left their mark on this beautiful island. The reception in Camp Vira has plenty of tourist information and helpful advice is always available from the English speaking staff, and no stay on the island can be complete without visiting some of the island’s coastal towns, admiring the island’s natural assets on the way and trying Croatian food and Hvar wine on arrival. Three well maintained sanitary blocks. Facilities for disabled visitors. Baby room. Laundry with washing machines and dryers. Dishwashing facilities. Motorhome services. Supermarket. Restaurant (from 20/5). Boat launching slip and anchorage. Pedal boats and kayaks for hire. Bicycle and scooter hire. Play area. Dog shower. Entertainment programmes. WiFi (charged). 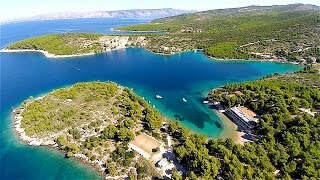 Site is on the island of Hvar 4 km. northwest of Hvar town. Take regular ferry service from Split to Hvar, alternatively ferry from Drvenik to Sucuraj then a 77 km. scenic drive, more suited to smaller units, along a narrow twisting road to Hvar (2.5 hours). From Hvar follow Vira signs.